It's a cat party in the shower ... until the water turns on. Ha! It must be cool on their little furry tummies! They are probably hoping to get a drink, too. 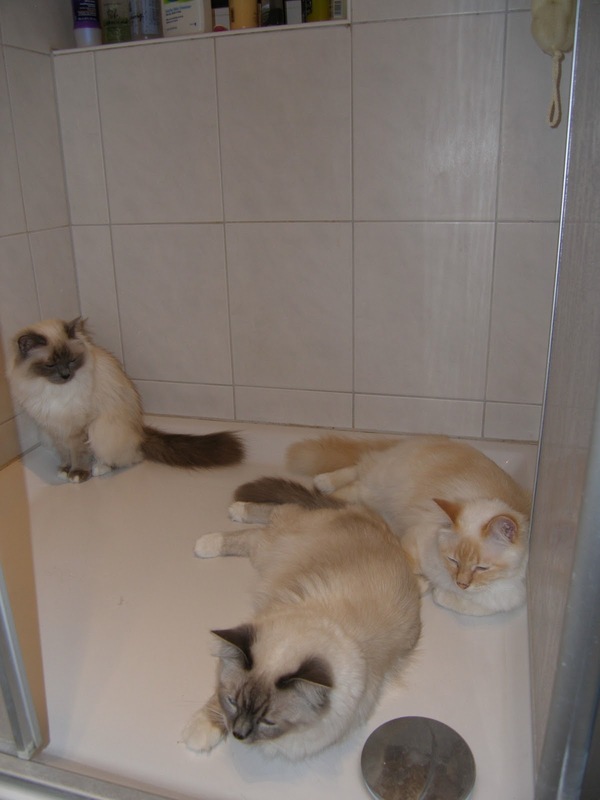 Cats always seem to be near where the water comes from: sinks, toilets, and apparently showers! My mother's cat dashes into the bathroom after a shower for a drink. Mine like to lay in the bath, too. Just to mess with Dante one day, I turned the tap on to a trickle and stopped the drain - he watched curiously as the water sloooowly crept up to him...and then FREAKED when the water touched his paws. It was HILARIOUS (I'm such a naughty kitty-mommy). What beautiful kitties!! They must be trying to escape the heat! My cats love sleeping in my bathtub. Or my sink. Great picture! Great pic -- and your little ones have gotten so big! I can imagine they would run away pretty fast! I love that they all want to be together like that. love it! Abby loves to lick water out of the bathtub after showers, which I think is disgusting. Muffin on the other hand, could care about water, unless it's in a glass or a sink! Is it difficult to keep those fluffy ones clean, or do they take care of themselves? I bet it's the coolness of the tile that attracts them. My cats seem to love the sink for the same reason. They are so cute! I just love cats! That's so adorable to see them all sleeping together like this! Mine only enters the bathroom to drink in the toilet, and only if I'm far away from the room; he's way to scared by the idea of water ON him to sleep in the bath!